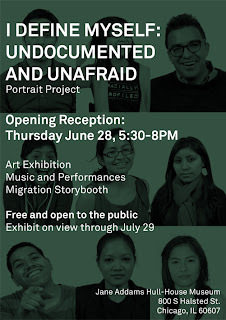 Windy City Banner: Exhibition Opening: "I Define Myself: Undocumented and Unafraid"
Exhibition Opening: "I Define Myself: Undocumented and Unafraid"
“The portraits call into question complex notions of visibility and identity. The faces on display conjure images of the thousands of immigrants who passed through the doors of the Hull-House Settlement, illuminating the Museum's rich tradition of supporting immigrant rights,” says Harish Patel, Program Coordinator at the Museum. The portrait collection plays with themes of legitimacy and authority in both the content and formal aspects within the installation. Wheatpasting, a popular and expedient method for displaying “unauthorized” images was employed as the primary technique in mounting the portraits to canvas around the Museum. The “I Define Myself” project was inspired by Inside Out, a global art initiative focused on the power of art and ideas to change perceptions, attitudes, lives and ultimately the world. Inside Out is a large-scale participatory art project created by the French street artist JR, who is the 2011 recipient of the TED prize. JR was awarded this honor for the massive photographic images he displayed on the sides of buildings, bridges, trains, buses, and rooftops in cities across the globe. Inside Out project group actions, transform messages of personal identity into pieces of artistic work. Participants of an Inside Out Project Action Group are challenged to use black and white photographic portraits to discover, reveal and share the untold stories and images of people around the world. These digitally uploaded images are made into posters and sent back to the projectʼs co-creators, for them to exhibit in their own communities. Posters can be placed anywhere, from a solitary image in an office window, to a wall of an abandoned building, or in a full stadium. These exhibitions will be documented, archived and be made available online at http://www.insideoutproject.net/. For more information on TED prize visit www.tedprize.org. The Jane Addams Hull-House Museum, part of the UIC College of Architecture and the Arts, serves as a dynamic memorial to social reformer and Nobel Peace Prize recipient Jane Addams, who with her colleagues changed the lives of her immigrant neighbors and influenced national and international public policy. The museum preserves the original Hull-House site to interpret and continue the historic settlement house vision, linking research, education, and social engagement. The museum is free and open to the public Tuesday – Friday, 10 a.m. to 4 p.m., and Sundays, noon to 4 p.m. For information, please call (312) 413-5353 or visit http://www.uic.edu/jaddams/hull/. WHEN: Opening reception: June 28, 2012 5:30-8 PM. 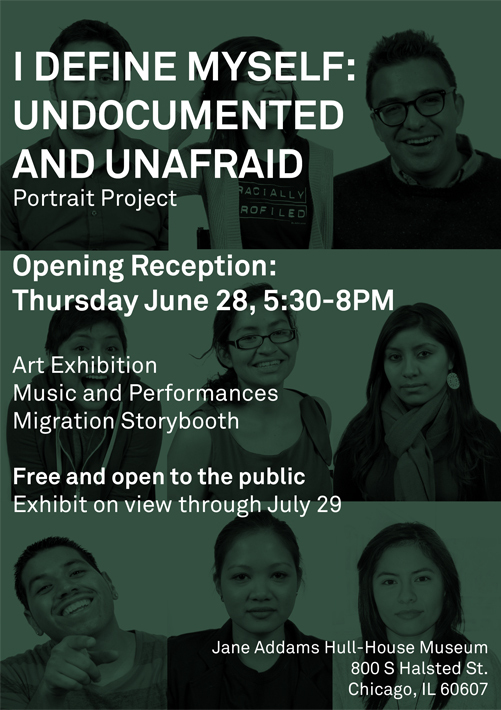 Art opening will include music, performances and a migration story booth. Exhibit on view through July 29, 2012. WHERE: Exhibit and reception: Jane Addams Hull-House Museum, 800 S. Halsted St. Chicago, IL 60607. Reception will be held in outdoor courtyard, weather permitting. Event is free and open to the public. DETAILS: 15 large-scale portraits hang on the property of the historic Hull House Museum.